My good friend Jaclyn came to visit LA a few days ago. It was lovely to have her. Our friend Jeff and I shared some good meals with her, including a much-anticipated tour to that bastion of snout-to-tail eating, Animal. The prospect of a nearly-exclusive animal-based meal got me to wondering what to select as the alcoholic accompaniment. 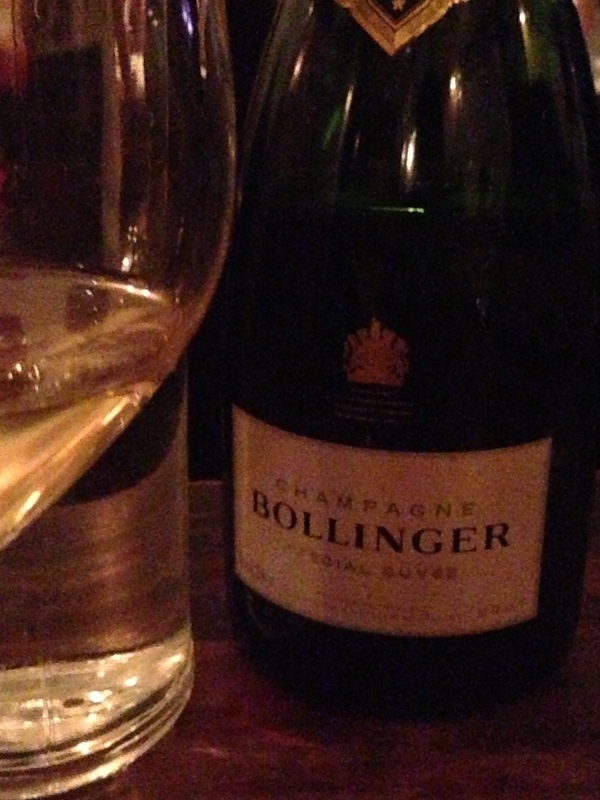 I could have safely selected a Burgundy, or a Beaujolais, but instead I went for another B: a Bollinger “Special Cuvee” Brut Champagne. Many commentators have noted that Champagne and other sparkling wines are rather underutilized pairing partners for food. This is a shame, as a brut (not sweet) Champagne is perhaps one of the most versatile wines: the mineral notes in a good Champagne can serve as a perfect complement to oysters, for instance, while the effervescence can enliven the palate after a rich bite of ribeye. 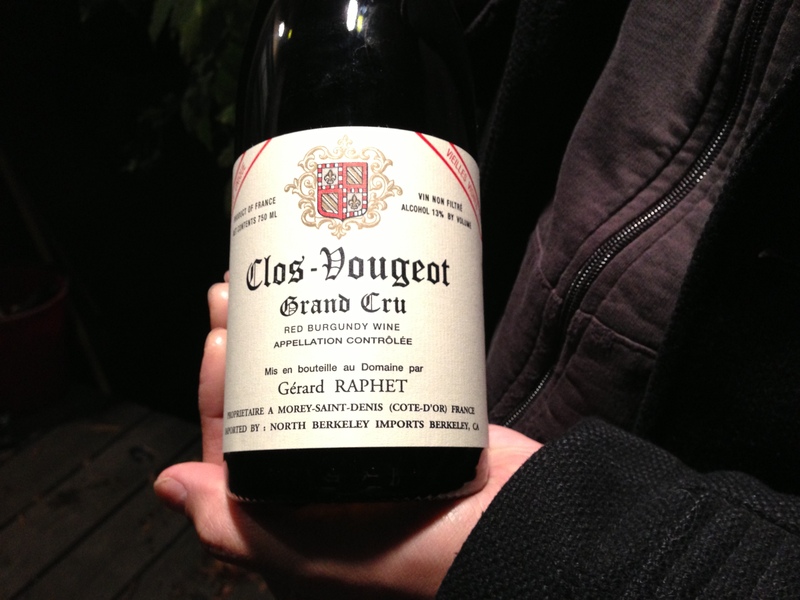 It’s not every day one gets to drink a grand cru Burgundy. Then again, it’s not every day that one is in Berkeley. I decided to take a short trip up to Berkeley for New Year’s, though I don’t know anyone here anymore (a fact driven home by the fact that I had a solitary–though excellent–meal at the fantastic Trattoria Corso on North Shattuck, which will be the subject of another post), to get out of LA and recharge my batteries for the full onslaught of 2013. 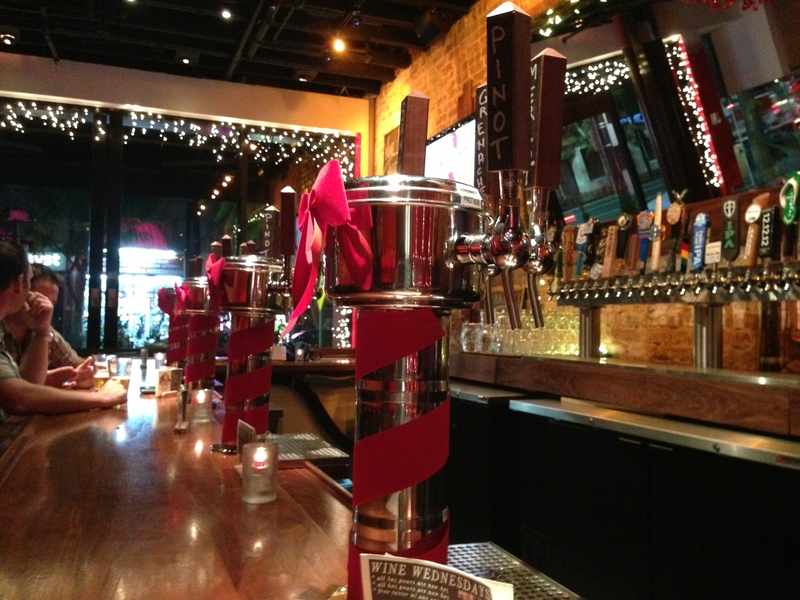 The wine tap revolution is underway. The wine drinker is now able to find establishments that serve wine on tap from New York (the excellent Brooklyn Winery) to Los Angeles (Father’s Office) and everywhere in between. Now, Angelenos have another great option in Hollywood at Lucky Devils, a restaurant and bar that just underwent some extensive renovations, part of which entailed having brand-new wine taps installed. I was invited to check out Lucky Devils and was very happy to do so; I remember having some beers there years ago, but I am much more a fan of wine than beer, and am a huge proponent of wines served on tap (which is economical, much better for the environment, and helps ensure very fresh wine). The space is great: in keeping with its name, the color palette is red. There’s a very long bar, tables, and booths. There are a large number of beers on tap, a full assortment of hard liquor, and 16 wines on tap (which is double the number at Father’s Office). In terms of ambience, it would be a good place for both dates and office happy hours. I sat down to quite a reception from the proprietor of Lucky Devils, who, not coincidentally, is named Lucky. Lucky has had an interesting life to say the least: he was an Army Ranger, model/actor, and now a restaurant owner. Sometimes life doesn’t work out the way we want it to, or plan it to. Sometimes it gets away from us. One of the compelling things about wine is that it is not only about the bottle, or the grape: wine means something. Without wine, at least for me, I would lose one way to look at and appreciate life. I don’t usually like jazz covers of pop songs. To me, they’re the epitome of elevator muzak. But now, on my second glass of 2009 Robert Craig “Affinity” Cabernet Sauvignon (approx. $45), this version of “Yesterday” by Lee Morgan is sounding pretty nice. 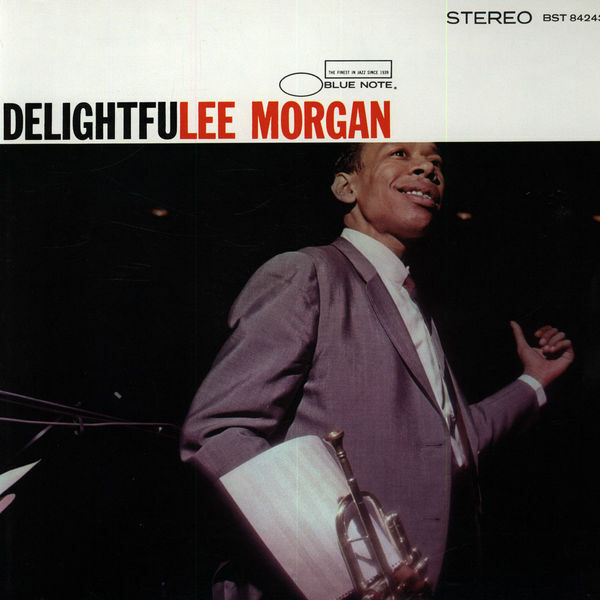 That doesn’t do Lee Morgan justice. Great bop trumpeter, much better at his chosen profession than I’ll ever be at anything I do, probably! As for the juice: a “Bordeaux blend” that is more California than France, consisting of 86% Cab Sauv, 6% Petit Verdot, 5% Merlot, 2% Malbec, and 1% Cab Franc. Wow, when was the last time you had a Bordeaux blend from Bordeaux that had Malbec? 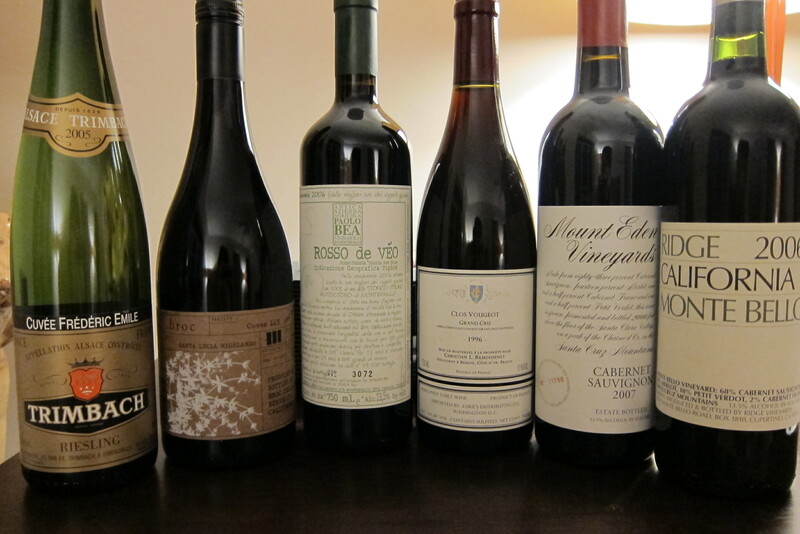 From left to right: 2005 Trimbach “Cuvée Frédéric Emile” Riesling, 2010 Broc Cellars “Cuvee 12.5”, 2006 Paolo Bea “Rosso de Véo” Sagrantino, 1996 Christian L. Remoissenet Clos Vougeot Grand Cru, 2007 Mount Eden Vineyards Santa Cruz Mountains Cabernet, and 2006 Ridge “Monte Bello” Cabernet. I didn’t buy the Broc or Paolo Bea at MacArthur; I also bought during my trip to MacArthur, however, a bottle each of Gruet Blanc de Noirs and Brut sparking wines and a bottle of Broadbent Vinho Verde. I should qualify that statement. I love Italian wine, and I believe Italian wine is exciting, versatile, and absolutely divine, but I know very little about Italian wine in general. There’s the Piedmont with its Nebbiolo-based wines, then Tuscany with its Sangiovese-based wines, but come on! Aren’t clones for sci-fi movies or Star Wars? And can’t Italy just have a reasonable number of varietal–say, one hundred–instead of like… thirteen hundred (or up to 3,500)? It also doesn’t help that many of Italy’s greatest wines–Barolo, Barbaresco, Brunello di Montalcino, for instance–are expensive and, in the case of Nebbiolo-based wines, tannic monsters when young. It is for all these reasons that, when it comes to that game of blind tasting, I am absolutely useless when I try to identify Italian wines. I can get Sangiovese, with its cherry and dried oregano notes, but I am just not as familiar with Italian wines as I am with French or Californian wines… not that I’m all that familiar with those, either! Greetings from the site of the Boston Tea Party, the first stirrings of the craft brew movement, and putative home of cream pies and baked beans. I am sipping a cold-brewed iced coffee in the really excellent Render Coffee Bar in South End, waiting for my three o’clock BoltBus to take me back down to New York. Though I spent only three days in this city, and most of those three days was spent in class, sleeping, or eating ridiculously-sized calzones, I can say that this city is absolutely awesome! 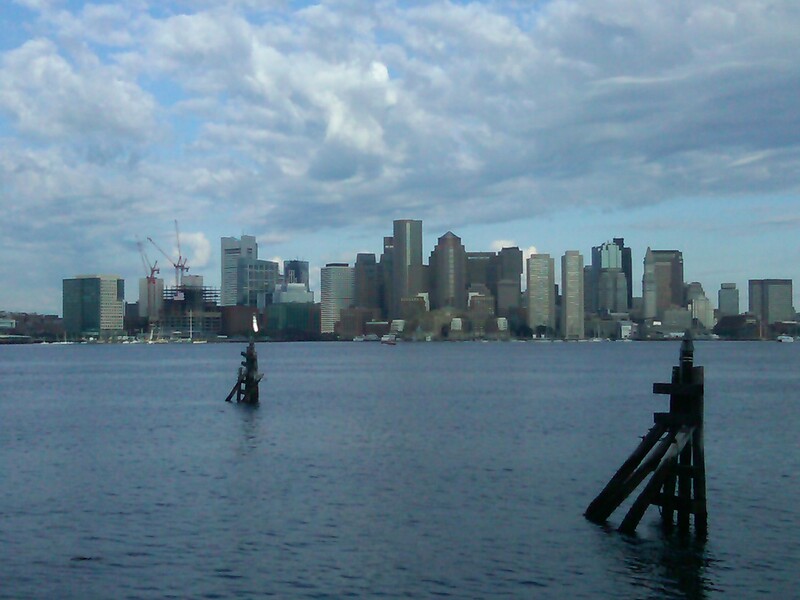 I came to Boston to take the Introductory Course offered through the Court of Master Sommeliers. This course is the first in a series of four “levels”, which increase exponentially in difficulty. To call oneself a “certified sommelier”, one must pass the the second level, the Certified Sommelier Examination. One may decide to get additional certifications, but attaining these become absurdly hard. For instance, the passage rate for the Master Sommelier examination is a bone-dry 5-10%. By comparison, the July 2011 California Bar Examination’s passage rate was 54.8%. That being said, my good friend Alex very generously invested in my scheme, which allowed me to enroll in the Introductory Course in mid-June. I received an e-mail with the course manual in PDF format, and over the next few weeks I looked through the manual and made a few flash cards. There is a lot of material to cover, including the major wine regions and their appellations, varietals, and classifications (such as AOC/AOP, DOC, and premier cru, grand cru, etc.). There is also a bit of information on beer, spirits, and sake, as well as on food pairings and service. Although the lectures and manual were very helpful, they were intended as surveys. For the course, we did not have to identify key vintages and, with a few exceptions, did not have to know individual vineyards or producers. (We did have to know a few of the Medoc first and second growths, as well as a random vineyard in the Mosel, but the instructors generally hint at the ones you will need to know.) On the other hand, I now know much more about Australia and New Zealand than I once knew! I just registered to take the introductory sommelier course through the Court of Master Sommeliers, and after reading about Burgundy in my course manual late yesterday evening I couldn’t wait to drink some delicious Pinot. 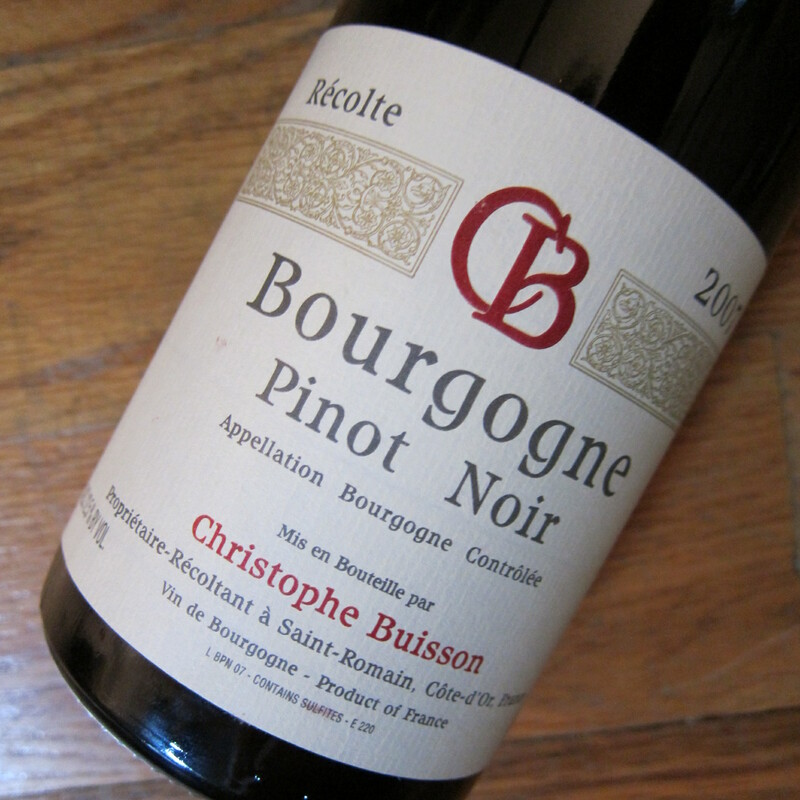 Thus, after doing a bit of work at Black Brick Coffee today, I stopped by at Bottle Shoppe and picked up a bottle of the 2007 Christophe Buisson Bourgogne. A Kermit Lynch selection, I figured that this basic-level Burgundy would make for simple, decent drinking. I was going to drink it with dinner this weekend, but my roommate Amit had just received some great news–his company, Bitponics, had just reached its $20,000 funding goal–and I decided that wine was called for. 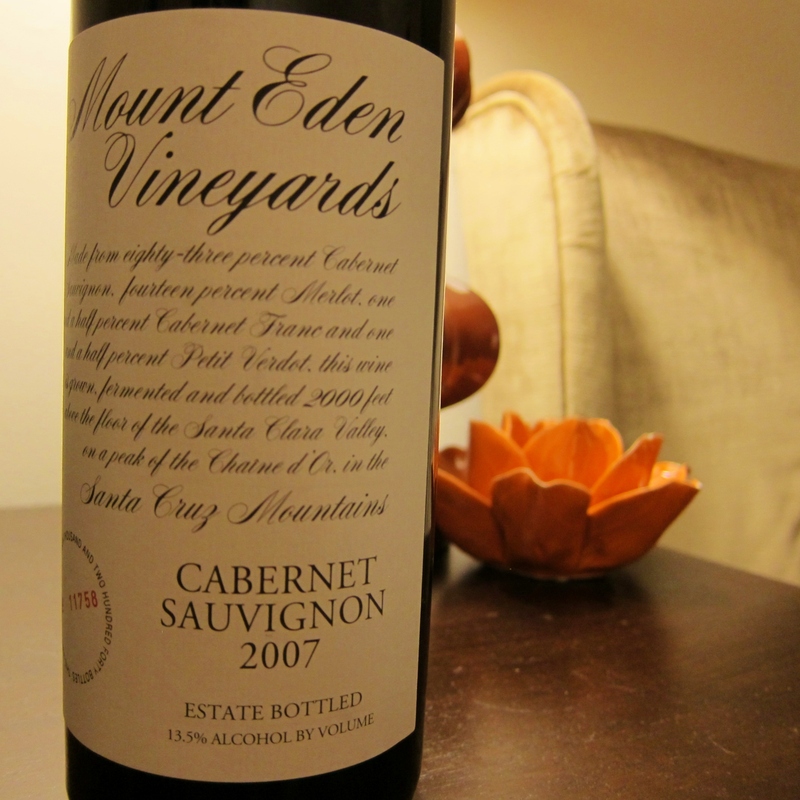 The first sip confirmed this belief: a bit tight, with sour cherries and a vivacious acidity. The finish was green stemmy, and I thought that some time in a decanter would improve it.